Big changes are ahead for students heading off for their first year of college: leaving home, getting used to new surroundings, meeting new people. Amidst these inevitable changes, some of this fall’s incoming first-years at Duke aimed to challenge themselves and learn about their new community of Durham – a city that is itself transitioning – before they even moved into their dorm rooms. 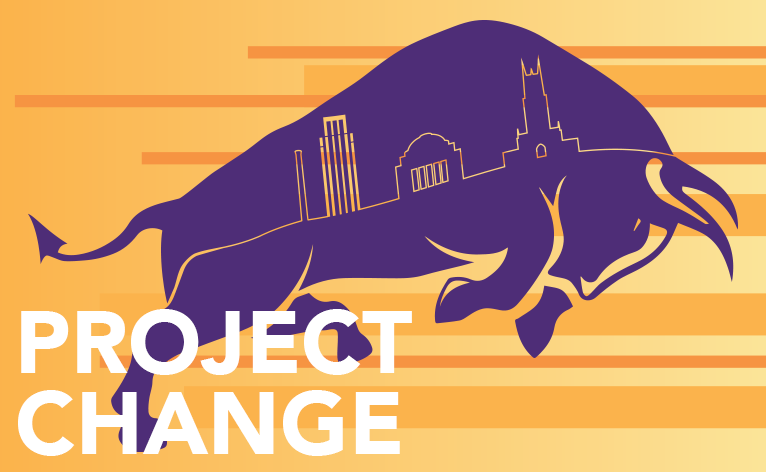 Now in its eleventh year, the Kenan Institute for Ethics’ Project Change is an eight-day, immersive, pre-orientation program for first-years focused on the ethics of transition—for students, for communities, for the city that will be participants’ new home. Partnering with local non-profit organizations, “pChangers” live, learn, and work in Durham during an intensive week spent with only minimal possessions (and no phones). In doing so, they learn to collaborate and to be more critical thinkers – they take risks, make mistakes, and meet challenges while learning from a diverse group of peers and community members. This year’s partners were Threshold Clubhouse, which works with adults with severe mental illness so they can succeed at work, education and other personal goals; TROSA, a non-profit focused on supporting substance abusers to become healthy, productive members of their communities and families; and Extra Terrestrial Projects, an organization that connects city-dwellers with wildlands and environmental stewardship through playful interactions. Teams of seven pChangers worked with one organization over the course of the program, learning about each organization’s mission while assisting with a project identified by each partner. “This engaged immersion enables the students to think about their place in the communities of which they are now a part, how to move to a place of humility to make space for other voices, and to be enriched by what others know and can do,” says Christian Ferney, program director at the Kenan Institute and longtime co-organizer Project Change. Reflecting on their experiences, this year’s participants gave group presentations about their intense and gratifying week. All the Project Change students agreed that working with a community requires letting go of the tendency to think that one knows what is best for a group when coming into a situation as an outsider. Participants said that they learned that community members themselves know best what they need the most.